...is nearing completion! The editors have been working full-time since the 12th edition was released in 2004. We now have about 5 times more information and nearly 100,000 illustrations ready to publish. 1. PRINTED, BOUND BOOKS in English (about 4000-5000 pages, in 4-volumes, each the size of the current 12th edition). It would include about 100,000 camera models and variants covering the entire history of analog cameras, with about 50,000 selected illustrations. English language only. 2. ONLINE & MOBILE EDITION for access by computer, tablet, smart phone, etc. 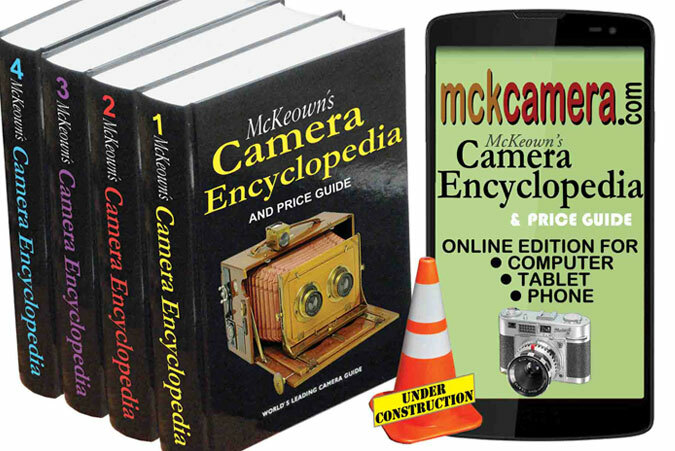 This would be a fully-indexed, searchable electronic version of the new McKeown's with the same content as above, plus ongoing updates and multiple language translations. In order to begin the final formatting, we need to determine the interest and wishes of our customers, so we can proceed with one or both of the above options. Your answers remain anonymous; your honesty is appreciated. If it could be only one or the other, which would you prefer? For online edition, besides English, what language would be useful to you? We hope to publish in 2016. Please enter your email address for progress reports and to be notified before publication.